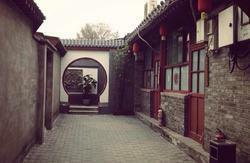 Welcome to the Happy Dragon *Courtyard*, offering a wonderful traditional atmosphere whilst combining great value with both space, comfort, entertainment, and super-convenient location for seeing both ancient and modern BeiJing. Within just two and a half years of opening, Happy Dragon Hostels have established a great reputation as being Beijings best, with our teams guaranteed fantastic service (were justifiably famous within the hostel industry for making every possible effort for our guests) and our Courtyard provides a real feel for old BeiJing, whilst maintaining the best modern facilities and cleanliness that from our management teams years of hostel experience we know our customers expect, yet will still be pleasantly impressed with which we can be proud to say is not our dream, it is our reality! With our courtyard dating from approximately 1820, during the Qing dynasty, we have retained many of the original features and elements from that time, including statues, imbedded wall sculptures, ornaments, beautiful red lanterns to light the evening after watching a glorious sunset, a water-feature goldfish and turtle pond with bamboo trees, a wishing-well and original architecture providing an authentic atmosphere, plus a central hub of modern bar and restaurant lounge furnished for comfort and pleasure. Youll also feel safe and secure with our fully fluent (multi-lingual) English-speaking 24hr reception staff and hostel staff always on-hand to help, plus reassuring security measures. In addition, whilst theres always plenty of fun to be had, theres also space enough for comfort and quietness after a hard-days sightseeing here in Chinas awesome capital city. In addition we can also help you book domestic and international flights and train tickets as well as being able to book you hostels throughout China. Whatever your expectations may have been, we guarantee youll be both delighted and surprised, and we all look forward to seeing you here: Welcome to Happy Dragon Courtyard. FREE food parties: Chinese dumplings, BBQ. Efficient laundry service at 15rmb per kg. 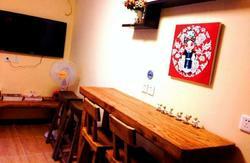 Address: No51, Dongsi Jiutiao, Dongcheng district, Beijing. 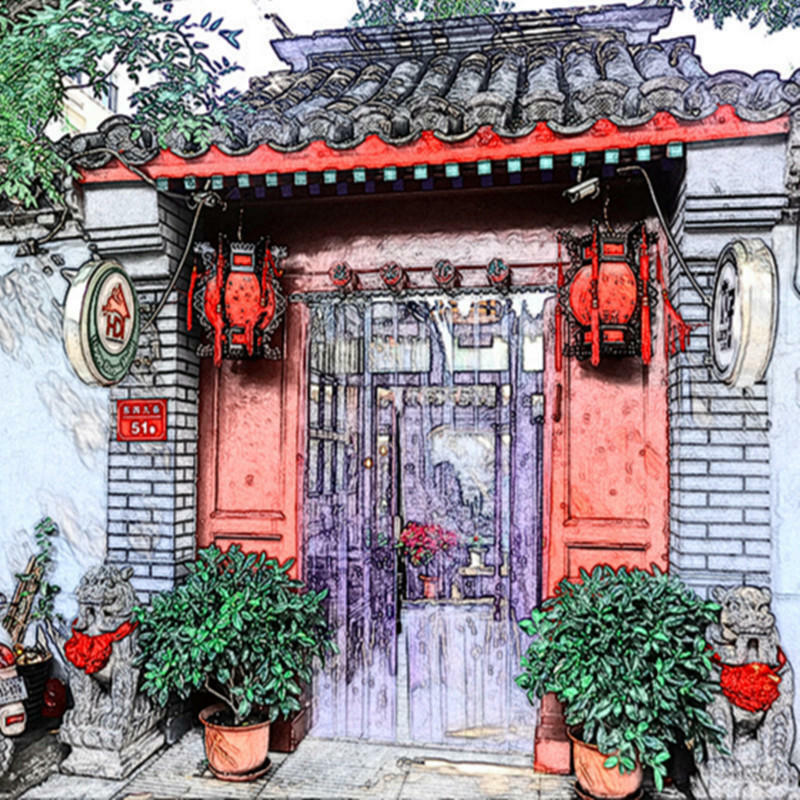 From Zhangzizhonglu subway station on Line 5, leave by the south-east exit gate C. Then walk just around the corner onto the main road Dongsibeidajie until the entrance just on your left into the signposted Dongsi JiuTiao Hutong. Walk straight onwards for around 3 minutes (youll pass another hostel and also, just before our entrance on the left side of the street, a vintage black saloon sedan car, a relic from the Communist era) and you will see our sign and red front door entrance with two ornate stone lions proudly standing guard outside. If arriving late at night/early morning, please ring the door-bell. 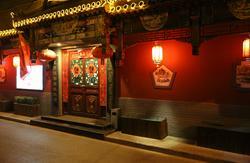 AIRPORT - From the airport a taxi will cost around 100 to 130 RMB. Alternatively you can take the Airport shuttle train to Dongzhimen subway, then take subway Line 2 one station west to YongHeGong Lama Temple station, then change to line 5 and travel south two stops to exit at Zhangzizhonglu station. This will cost 27RMB. BEIJING STATION From the Beijing main station you can take subway Line 2 one stop west to Chongwenmen station and then change to Line 5 and travel north 4 stops to the Zhangzizhonglu stop (tickets are 2rmb). Then follow the directions as above. WEST TRAIN STATION - From Beijing West station it is easiest to take a taxi for about 25 RMB. BEIJING SOUTH STATION - take subway line 4 to Xidan subway station, then change to Line 1 to travel east 4 stops to Dongdan station, then transfer to Line 5 to travel north 3 stops to Zhangzizhonglu station, then follow the directions as above.